HOUSTON -- Never has the inherent risk of relying on the 3-point shot played out to such dramatic extremes, neatly summarized in two halves that should serve as a cautionary tale to the Houston Rockets. They went from making 12 of 20 3-pointers in a blazing 73-point first half to missing all 14 3-point attempts while producing the second-lowest scoring second half -- 19 points -- in NBA history as they fell to the Oklahoma City Thunder 104-92 Thursday night. There's regression to the mean ... and then there's diving off a cliff to land in a puddle of the mean. It's one thing for the outside shots to stop falling. That's going to happen. But the 54-point drop from first half to second half was the largest in NBA history. And the way it went down -- with the offense bottling up while settling for now-contested 3s -- doesn't bode well for Houston's championship aspirations. Dwight Howard's arrival was supposed to bring balance to the Rockets, giving them an inside presence on both ends of the court. And they are averaging 50 points in the paint per game, up five from last season and good for third-best in the league (They also happen to be third in 3-point attempts per game). 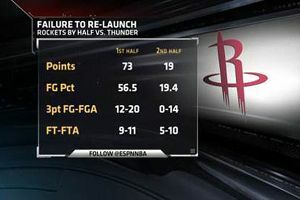 ESPN Stats & Info It was a tale of two halves for the Rockets at home. However, Howard is still capable of getting caught up in wrestling matches that lead to double-fouls and double-technicals that can limit his playing time. And there's also the poor free-throw shooting that makes throwing the ball inside to him late in games a gamble. Howard finished with 11 points on 5-for-13 shooting in the loss, and was diplomatic when asked about his need for more touches. "We've got to play the right way if we want to win," Howard said. "Once we figure it out, we'll be fine." Is it the mindset or the way the team is set up? What do they hang their hat on, other than scoring a lot of points when they're hot? It helps when the opponent doesn't bother to actually guard the shooters, as Oklahoma City was lax to do in the first half. But after Thunder coach Scott Brooks showed his team video clips of every Rockets made 3-pointer at halftime, the Thunder got more aggressive on defense. The offense came along, and things started going their way. While the Rockets banked on 3-pointers and lost, the Thunder banked in a 3-pointer (by Reggie Jackson) and won. Kevin Durant also hit one as he fell down and executed a backward somersault at the end of the third quarter, tying the score. Then came the 21-9 fourth quarter, and a stunning victory for the Thunder, still playing without the injured Russell Westbrook. "Hell yeah it was a statement win," said Westbrook, interjecting his opinion to a question asked to Durant. Durant, always the more diplomatic of the duo, said it was, "Just coming out and getting a win against a really good team on their home floor. We're just trying to build, man, and every day is a process. Today was a good step forward." The fact is, if the Thunder can do this to the Rockets without Westbrook, they can smoke them in a playoff series with him. Yes, Oklahoma City has its offensive struggles and sorely misses Westbrook's playmaking ability. Only three Thunder players reached double-digit scoring Thursday -- half the number of Houston's. But one of them was Durant, and his 36 points were more than any two Rockets combined. To be fair, the Rockets have quietly been an injury-plagued groups themselves, with an assortment of ailments costing them 84 missed games before Thursday. Backup center Omer Asik and point guard Patrick Beverley are still out. "We're good," James Harden said. "Once we get all our guys back and healthy, we'll be all right." He still saw warning signs ... and not just from the way this game played out. "Even when we win ... if we're not making shots, we've got to figure out other ways to make the game change for us," Harden said. They could learn from Durant, who missed 10 of his first 17 field goal attempts but still scratched his way to 31 points through three quarters by making 15 of 16 free throws. Or from Kendrick Perkins, whose agitation of Howard made up for his lack of offensive production. But mostly they can study the box scores from the first half and the second half, and consider themselves warned about living life beyond the 3-point arc. MVP: With Russell Westbrook out, could there be any doubt? Kevin Durant scored 36 points to go with seven assists and five rebounds while guarding James Harden down the stretch. Honorable mention to Serge Ibaka, who piled up 21 points, 15 rebounds and five blocks. That was ... feast and famine: The Rockets poured in a staggering 73 first-half points, including 41 in the second quarter. After the break, Houston managed just 19 more. The difference was good for an NBA record. X factor: Three-point shooting. In the first half, Oklahoma City missed all of its attempts from behind the arc, while Houston made a whopping 12-of-20. In the second half the Rockets miss all 14 of their attempts. MVP: Joe Johnson was simply scorching in London. He had 29 points in just 30 minutes of action, sinking six 3-pointers, two of which were buzzer-beaters. X factor: Andray Blatche. Given the balanced scoring output of the Nets -- five players scored in double figures -- several players could be deserving of this award. However, Blatche lays claim thanks to his 14 rebounds and six assists (though the five turnovers weren't pretty) off the bench. That was ... a 3 party: The Nets showed no sign of jet lag in this display of offensive firepower. They hit 16 of their 27 3-point attempts. Whenever it seemed as if the Hawks might close the gap, the Nets promptly swished another 3, burying any hopes of an Atlanta comeback. MVP: Lance Stephenson's All-Star campaign hit a fever pitch as the fourth-year guard set a career high with 28 points, dished numerous highlight-worthy passes and was a rabid hellion on defense, all while posing for a the camera like a silent film star. LVP: Ankles. Both Amar'e Stoudemire and Kenyon Martin had to leave after suffering injuries to their left ankles. It wouldn't have made a difference in this game, but it was yet another blow to a team that's struggled to stay healthy all season. That was ... the best team in the East: The Pacers were a finely tuned, brutishly effective machine on both ends of the court, leaving the Knicks to stare in awe. Kevin Durant, Thunder: While the Rockets were busy reenacting "Godfather: Part 3," Durant was at the center of the Thunder's comeback win. He finished with 36 points, 7 assists and 5 rebounds for OKC. Houston Rockets: If you're going to collapse, collapse big. With 73 points in the first half followed by just 19 the rest of the way, Houston set the NBA record for largest points disparity from half to half. First half = Godfather 1 & 2. Second half = Godfather 3. "They're a good team, but I don't think they're 30 points better than our team. We were awful." -- Knicks coach Mike Woodson, on New York's 117-89 loss to Indiana on Thursday. 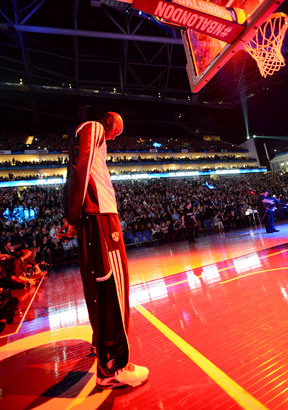 Jennifer Pottheiser/NBAE/Getty Images O2 Arena welcomed the Nets and Hawks from across the pond, and watched KG & Co. improve to 3-0 all-time in London with an easy win. The Rockets scored a season-high 73 points in the first half, and a season-low 19 points in the second half. That 54-point disparity is the largest by a team in a game in NBA history.